Helena has been coming to the centre for about 8 years. Her parents were Ludovico and Olive. Her father was Italian, from Piacenza. He had come over to work, in Bournemouth where Olive lived, to lay mosaic floors. This was at the turn of last century. 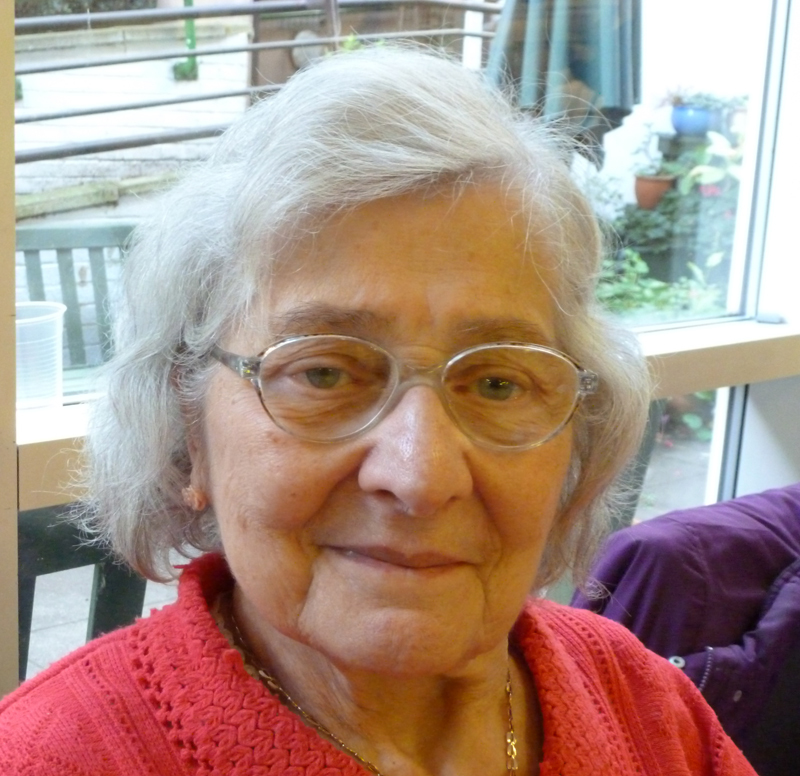 After Helena’s oldest sister, Monica, was born in Boscombe in 1911, Helena’s mother travelled with Ludovico to Italy so he could join the Italian army. Olive returned to England, with a new baby boy but on the journey back the baby died. Back in England she later lost a baby daughter. But went on to have four boys, Tony, Victor, Denis, Paddy. And then, Helena. Helena was brought up on the east side of Rosebury Avenue but the family moved to Holsworthy Square, Elm Street, WC1. ‘That was a nice flat. Three bedrooms, second floor, scullery, toilet, big living room – no kitchen as such,’ remembers Helena. Helena went to St Ethelreda’s School in Saffron Hill. She said the teachers were good there – Mrs Hawkins was the headmistress. One time, she got ‘one particular girl’ to stand up in front of them all, ‘till she told the truth’. ‘She was a very good teacher. She took no nonsense.’ Helena’s teacher was Miss Mcke. She made them made all laugh. Her secondary school, the Convent School, was in Ely Place, where she was taught by nuns. When war broke out the nuns went up to the Mother House in Loughborough but Helena’s mother kept her at home, so she stopped going to school. Helena was a teenager during the war and her mum was quite strict about her going out. She remembers her dad would always put on his hat before going down the tube station shelters. One night, during the war, Helena’s dad came back from work with a cat he’d found in his shoe at work. Helena knew she wanted to work in an office and started work in the late 1940s. She worked as an Electrical Development Assistant, at the British Electrical Development Association which became the Electricity Council, at Savoy Hill. She caught the 33 tram to work. She liked the atmosphere at Savoy Hill – the BBC were there as well. She didn’t particularly want to work for the papers but the work appealed as she liked to hear the different stories about what was going on. She did a Pitmans Shorthand course at Pitmans College in Theobalds Road and got a job with Associated Newspapers on the Evening News, The Daily Mail and The Daily Sketch as a secretary in the Advertising department. Helena also went on to work for the Mirror Group. She remembers her boss from her first job. It was Mr Bayetto – he was quite handsome and good at his job. Helena remembers that the pay was good but she can’t remember how much she earned. She liked to spend her money on clothes. Helena retired in 1988. She didn’t get married and she didn’t leave home. She stayed with her mother, Olive. 1. If you had a time machine where would you go back to and why? To being with her family.